Music stars David Bowie, Paul Weller and Morrissey have made it on to the shortlist for the second annual Mojo magazine awards. The Mojo Honours List winners will be announced at the Porchester Hall in Bayswater, London, on 16 June. The list was set up to honour elder artists often overlooked for awards. Paul Weller has also been nominated for the Mojo songwriter award for a second time. He is up against Van Morrison, Damien Rice, Kate Bush and Brian Wilson. Last year's icon award winner Morrissey has been nominated for the inspiration category on a shortlist also featuring Neil Young and The Pixies. Other categories in the awards include the classic album award and the lifetime achievement award. At last year's inaugural event, The Clash won the inspiration award and Ray Davies of the Kinks was given the songwriter's prize. 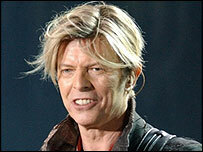 Other stars honoured included James Brown, Marianne Faithfull, the Red Hot Chili Peppers, Sting and the Black Eyed Peas.